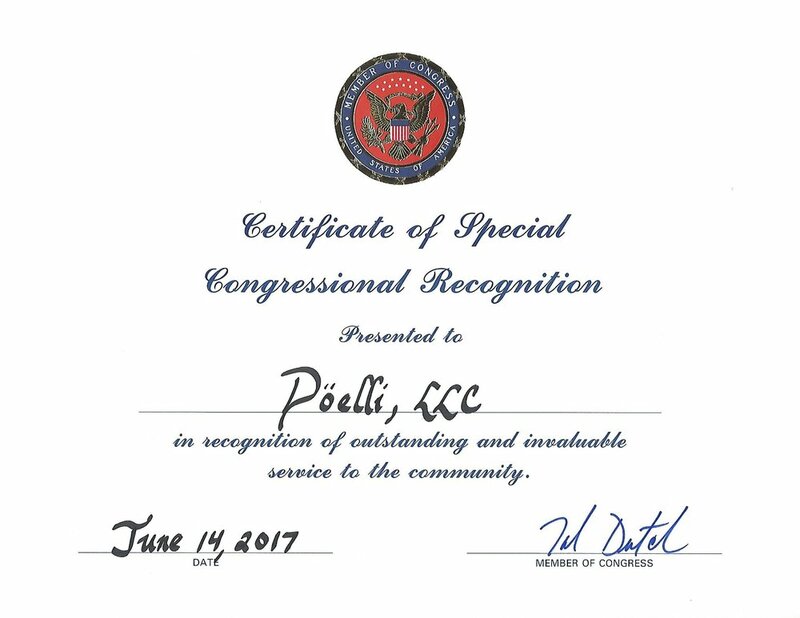 The Honorable Ted Deutch, U.S. House of Representatives, issued a Certificate of Special Congressional Recognition to Döelli, LLC on June 14, 2017 for achieving public distinction. This recognition was presented at the commencement of the Veterans Procurement Institute (VIP) graduation ceremony that Döelli, LLC successfully completed as part of the firm’s federal procurement strategy. On 5-17-2017 the U.S. Department of Veterans Affairs (VA), Center for Verification and Evaluation (CVE), officially verified Döelli, LLC as a Veteran Owned Small Business (VOSB) and added Döelli, LLC to the Vendor Information Pages (VIP) at http://www.vip.vetbiz.gov. Döelli, LLC is now officially eligible to participate in Veterans First Contracting Program opportunities with the VA.
Döelli (pronounced dōh-lēy) is a boutique consulting firm specializing in making organizations more visible, capable and profitable. BOCA RATON, Fla., June 27, 2016 /PRNewswire/ -- Last year, Scott Doellinger left his Plan Administration leadership position, at the National Council on Compensation Insurance (NCCI) to form Döelli, LLC. After years overseeing the successful operations of 24 different state residual market Workers Compensation Insurance Plans totaling nearly $1.2 billion in annual premium, he identified a need for a consulting firm that offered niche workers compensation line insurance services, and with that, Döelli was established. Döelli (pronounced dōh-lēy) is a boutique consulting firm specializing in making organizations more visible, capable and profitable. They consider themselves a "limited edition" management consulting firm that fosters fresh, game-changing solutions and creating customer experiences that express an organizations identity better, deepening the relationships and driving retention and revenue growth through strategic planning and design through consulting services that include: Strategic Solutions | Improving Efficiency | Reducing Cost | Product Strategy | Marketing Solutions | Evaluating New Opportunities | Operational Improvement | Financial Performance. Döelli's niche insurance practice is built upon deep industry knowledge and dedicated specifically to the workers compensation line of business with a focus assisting regulators, insurance carriers, employers, agent/brokers/producers, rating bureaus, trade associations, third-party administrators, MGU's, captives, PEO's, self-insureds and law firms nationwide with: Plan and Pool Administration Performance Audits | Alternative Distribution Channels | Affinity Products | Conducting Servicing Carrier & TPA Vendor RFP Selection Process | Evaluating Servicing Carrier Feasibility as an Additional Source of Revenue for Insurance Carriers | Assigned Carrier Performance Audits | Classification Dispute Reviews and Opinions | Data Reporting | Underwriting Rules. Stop by doelli.com and take a look around at what they have to offer. They know that in today's economic climate, it's essential that organizations do more with less and get the most out of their existing assets and Döelli is here to help. Talk to Döelli. They believe they can find a better way! As interest and demand for boutique consultancies increase, what core services and different business styles are they offering? The growth and popularity of boutique consultancies has been increasing, especially since the Great Recession. Clients, as well as consultants, often have to choose among different types of consulting firms in order to select which one is the right fit for their needs. This article reviews some top boutique consulting firms, with descriptions about their niche offerings. Additionally, some pros and cons of work environment and client services are also examined regarding the boutique consulting spectrum of companies. Such firms include Doelli, which has an entire web page dedicated to explaining how their approach and services differ from a large firm. This Boca Raton management consultancy makes points on their website such as larger consulting firms doesn't necessarily equate to better results and that “big ideas” may be more likely to come from a smaller/niche firm because larger firms have a siloed way of operating. Furthermore, they state that a larger firm might be more likely to assign more staff than is needed for a given project while Doelli claims that they build all their consulting projects to scale to abide by the client’s needs. You Can't Keep Ignoring Gen-Y. Ignoring what’s become the largest generation since the Baby Boomers puts any business at risk. Generation-Y or “Millennials” (born 1981-2000) are over 80 million strong, which is surpassing Boomers. NOT understanding them, NOT finding ways to be relevant or engaging to them, and NOT adapting to their new expectations— is the easiest way for a brand to be overlooked. Speak to the values that drive them. Understand their realistic lifestyles and experiences. Make them feel informed and involved, not just marketed to. Talk to us. We believe we can find a better way. 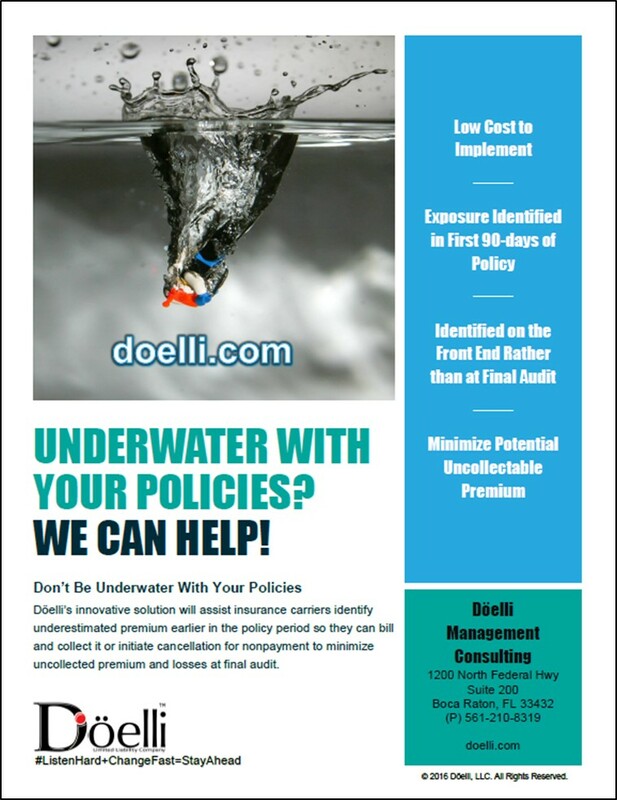 Döelli’s innovative solution will assist insurance carriers identify underestimated premium earlier in the policy period so they can bill and collect it or initiate cancellation for nonpayment to minimize uncollected premium and losses at final audit.